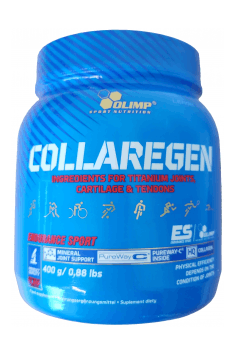 OLIMP Collaregen is a dietary supplement, which in a complex way protects joints and helps to rebuild connective tissue. In the composition of the preparation there are high-quality collagen, vitamin C (PureWay-C®) as well as manganese and copper in the form of highly assimilable amino acid chelate Albion®. The preparation strengthens resistance of joints to injuries, stimulates regeneration processes and mitigates pain symptoms related to connective tissue dysfunctions. Collagen belongs to the group of fibrillar proteins and appears in the majority of tissues and organs of the organism (among others in bones, tendons, ligaments, skin and mucosa). Collagen proteins are the component of extracellular matrix and constitute 1/3 of all proteins present in the organism. Collagens are characterized by unique structure rich in amino acids, such as proline, hydroxyproline and glycine. They are mainly built of 3 levorotatory polypeptide chains, which they wind around themselves creating dextrorotatory conformation of superhelix, maintained thanks to the presence of hydrogen bonds. The basic function of collagen in the organism is primarily maintaining integrity and flexibility of connective tissue and making it resilient to stretching. Moreover, collagen interacts with the receptors, which are responsible for the adhesion, differentiation and growth of cells and supports corrective mechanisms and facilitates wound healing. Collagen may also be an effective tool both in the therapy and prophylaxis of joint cartilage dysfunction. It was proven that supplementation with collagen may support anabolic processes, which take place in joint cartilage and may positively influence the homeostasis of extracellular matrix. Additionally, collagen may turn out to be helpful in case of pain symptoms, limited mobility of joints and the feeling of stiffness in people with osteoarthritis. Collagen proteins positively influence not only the condition of joints, but they are also responsible for elasticity and firmness of skin. Vitamin C takes part in many important enzymatic reactions, counteracts harmful processes of oxidation and influences proper functioning of the nervous system and immune system. This vitamin is a cofactor for many enzymes engaged among others in the processes of collagen synthesis and maintaining proper state of connective tissue. Vitamin C deficiency is manifested mainly in the form of muscle and joint pain, slower regeneration of wounds and inflammation of gums. Manganese is a trace element influencing the activation of many enzymes, i.a. glycosyltransferase and xylosyltrasferase, which are essential for the proper synthesis of proteoglycans (the ingredients of extracellular matrix). Manganese deficiency manifests itself mainly in the form of disorders of motor coordination and injuries in osteoarticular system and it may also contribute to the increased risk of developing osteoporosis. Copper positively influences the process of collagen biosynthesis and protects from the effect of reactive oxygen species. Copper also takes part in elastin synthesis, thanks to which it positively influences skin elasticity, slows down the signs of aging and strengthens the structure of hair and nails. Copper deficiency may lead to, i.a. disorders of connective tissue, which may contribute to rheumatoid arthritis and osteoporosis. Summing up, OLIMP Collaregen is a dietary supplement addressed to people who are prone to increased risk of joint injuries, as a result of excessive burden or other factors that may influence the structure of joints. The preparation is recommended primarily to people, who may develop the syndrome of premature joint cartilage degradation – people prone to frequent injuries related to work (sportsmen, massagers, physical workers) and people who expose their joints to increased tension (obese people). Also elderly people, among whom the surface of joint cartilage is decreased should take care about proper level of collagen in the organism. The supplement may be taken above the age of 25, as then joint cartilage may slowly undergo the process of degradation, which is related to the advantage of degradation processes over the processes of synthesis. 1-2 portions a day between meals. Dissolve 1 portion (5,5 g of powder – 18 units = ½ scoop = 1 tablespoon) in 100 ml of water. Drink immediately after preparation. Supplementation with collagen is recommended not only in case of pain symptoms, morning stiffness or limited joint mobility. Supplementation should be started as early as when the risk of excessive burden of our joints appears, e.g. in the period of intensive preparations to competitions. It is believed that collagen in the form of dietary supplement should be taken on an empty stomach, therefore it is recommended to take the supplement ca. 2-3 hours after the last meal. In order to achieve the best result, it is recommended to take collage max. for 2-4 months. Citric acid - acidity regulators; maltodextrin, flavors, sodium cyclamate, sucralose - sweeteners, pigment: riboflavin, beta-carotene (for orange flavor), riboflavin (for lemon flavor), carmine (for flavors) : grapefruit and cherry). A stimulant-free pre-workout supplement that promotes the muscle pump. Pre-workout booster consisting of creatine and beta-alanine. It increases performance during intense exercises. Increases metabolic capacity and decreases calorie burning, resulting in rapid weight loss.